For more than 10 years Bafang has been developing components and complete systems for electric bikes and electric scooters. The head office and the development centre of the company are located in Suzhou (China), but Bafang sells its products very successfully in Europe, China and in the United States. In 2015 Bafang sold 830.000 engines and more than 260.000 complete systems worldwide (more than half in Europe) – this makes Bafang to one of the leading suppliers in the European market. Since 2012 Bafang has an office in the Netherlands to be closer to the market and to provide an even better service for the European customers. The Bafang portfolio includes a complete product range of components for electric bikes and electric scooters, including high-quality engines, batteries, sensors for a natural driving feel and user-friendly HMIs (human machine interface). Bafang produces different electric bike drive systems with front-, rear- and mid-mounted-engines (geared motors). Quite popular is the innovative Bafang Max Drive system. This system is driven by a powerful mid-mounted engine, available in two versions: 250 W (engine support up to 25 km/h) or with 350 W (for faster S-Pedelecs). The maximum torque is more than 80 Nm. The system is easy to install and compatible with all customary frames. In fact, Bafang drive systems are very well suited to turn normal bicycles into fully motorized electric bikes. It is no surprise that Bafang drive systems are used in many electric bicycle conversion kits – for example, in the well-known “ELFEI conversion kits” from “Elektrofahrrad Einfach” (=”Electric Bikes Easy”) or in the “EBS Plug & Drive conversion kits” from “Ebike-Solutions”. Bafang electric bike engines are considered as very reliable and they have a high durability, too. 3 Is it possible to optimize / tune Bafang electric bike engines? Yes! At present, there are not many tuning tools for Bafang engines available yet, but there is at least one recommendable tuning tool especially for Bafang Max Drive mid-mounted engines on the market. We are confident there will be more Bafang electric bike tuning tools in the future. 4 Which Bafang Tuning Tools do exist? This is a microprocessor-controlled tuning module for Bafang Max Drive mid-mounted engines. It removes the 25 km/h speed limit and shifts it up to 50 km/h. This allows you to drive twice as fast with full motor support. 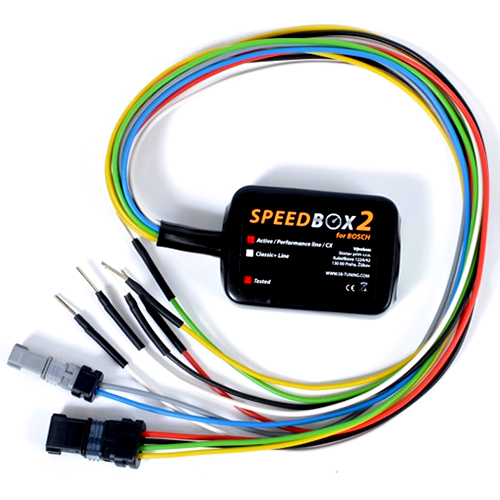 The Speed Box can be conveniently switched on or off via your electric bikes light button. The integrated microcomputer of the module has even been certified for the automotive industry. Please note that the electric bike display will only show half speed if the Speed Box is activated.